Smart motorways are being extended to almost 800 miles despite increasing concerns over their safety. 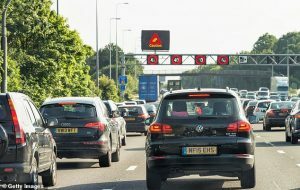 Highways England insists smart motorways, which do not have a hard shoulder, are safer because they have emergency lay-bys. But motoring groups fear the removal of the hard shoulder will pose a risk as vehicles will have no choice but to stop in ‘live’ lanes. Smart motorways work by using the hard shoulder as a permanent fourth driving lane, with variable speed limits controlling traffic. A red ‘X’ on overhead signs indicates accidents or broken-down vehicles ahead. In 2017, there were 16 crashes on smart motorways involving stationary vehicles, according to figures from Highways England. By contrast, there were 29 such crashes on the hard shoulder across the rest of England’s motorways, stretching roughly 1,800 miles. But a recent safety assessment of a stretch of smart motorway on the M25 in Kent found crashes had reduced by 29 per cent, with 9.3 crashes registered per 100 million miles.